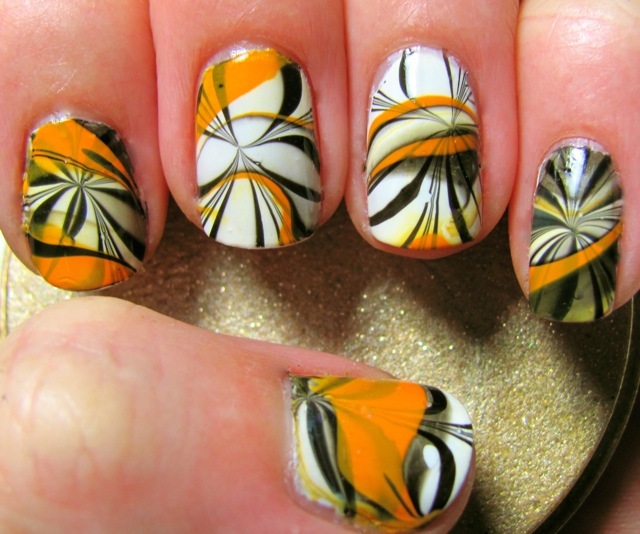 I knew I wanted to do a water marble with Halloween colors. I also had bought glow-in-the-dark polish. I thought it would be cool to do a double marble with glow-in-the-dark polish for the top layer, but when I went to try and marble with the glow-in-the-dark polish, it did not work at all to marble with. However, I didn't want to give up, but it's evident by the pictures from the pictures, I should have given up with the polish. So, this is barely a glow-in-the-dark miniature, however I like double marble look anyway and the end result turned out pretty nice. For the base color, I painted two coats China Glaze White On White. The base marble used China Glaze White On White and China Glaze Liquid Leather. The top marble used China Glaze Papaya Punch, China Glaze Liquid Leather and Piggy Polish Nocture-nail. The entire manicure was coated with one coat Seche Vite. Love the marbling! Isn't the glow in the dark polish FUN!? I LOVE mine! 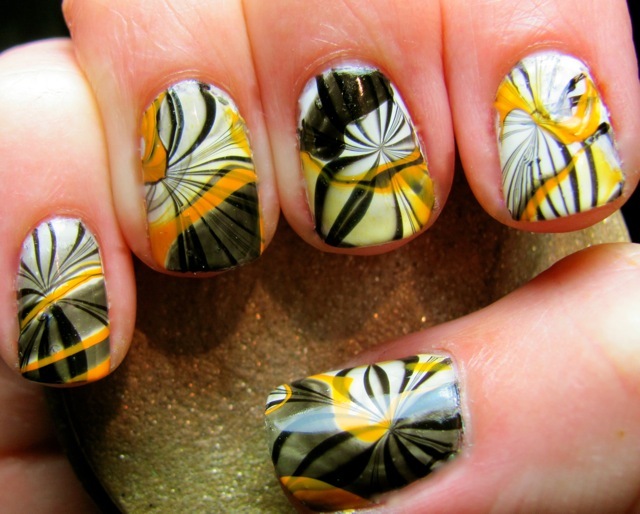 I love this double water marble, looks so nice! I have never thought to double marble! Cool! 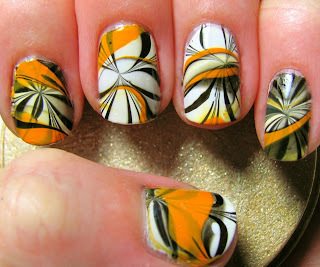 Omg clearly I am behind at life, because I had never heard of marbling.. but it's something that I need to try RIGHT NOW! Look amazing! Oh I love the double marble!!!! Something I tried last time I marbled was marbling with a clear, so if you want to try using a glow nail polish, maybe use that as part of your base polish, and then the clear will give you the bright glow, and the marble colors like the black and orange will give you different depths?? Just an idea =) I am definitely going to have to try that double marble though!! !